C.A.S.T. for Kids at Harlem Meer . . . I learned of C.A.S.T. for Kids from my fishing friend named Morgan. 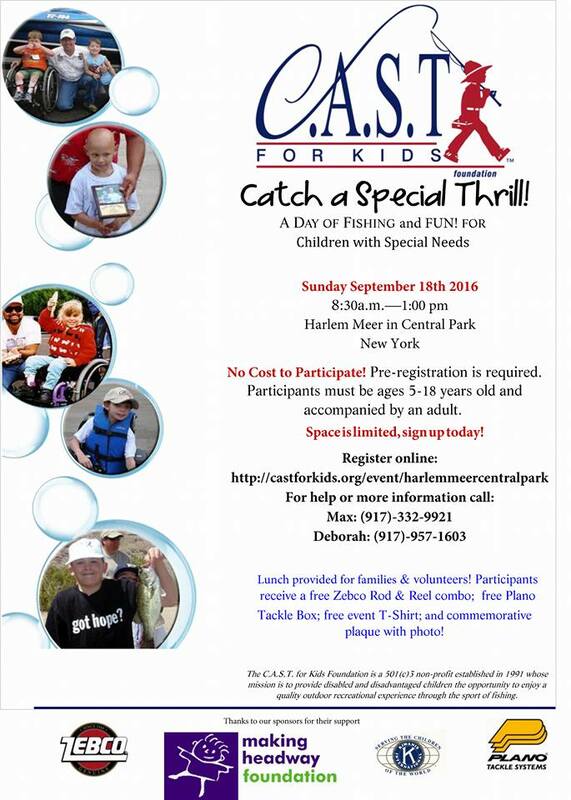 My appeal to you directly regards the event, a morning of city fishing, to be held on Sunday, September 18 at Harlem Meer in Central Park. 1) My wife’s twin brother, Louis, is a special needs citizen. 2) I am the author and illustrator of two books on fly fishing. The second, Small Fry: The Lure of the Little, includes a chapter on Harlem Meer as well as fly fishing with younger anglers. 3) I work part-time at Urban Angler, Ltd. on 5th Avenue and have independently guided several clients along The Meer, so I know the lake and how to fish there well. 4) I maintain an ongoing blog on tenkara, a simple form of Japanese fly fishing, great for Harlem Meer, which requires only rod, line, and fly. Physically challenged anglers have found the more simple style to be a godsend that allows them to keep fishing despite challenged limbs.